"It was my granddaughter's first time at camp and she had an amazing time, she is looking forward to the next camp." The Academy of Sport offers a holiday Sports Camps programme for children in the local community. We cater for children aged 5 (and in Year 1 of school) to 12 years old. Our rates are affordable and our operation hours fit in with parents' working hours. The Holiday camps not only introduce your child to new sports activities, they boost your child's physical activity, health, development and social skills. Our programmes are fun-packed to keep your child entertained throughout the day. 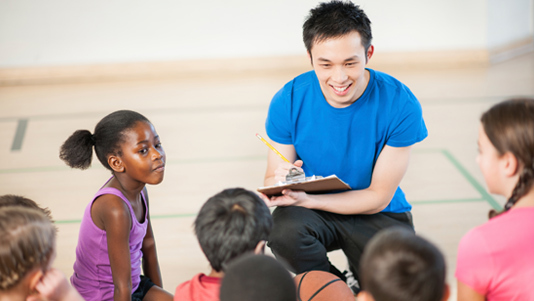 All sessions are led by our fully qualified Sports Ambassadors, who are Enhanced Disclosure and Barring Service (DBS) checked and have Child Protection and First Aid training. We offer a range of fun and engaging activities such as Dance, Netball, Football, Basketball, Martial Arts and much more; finishing off Sports Camp every Friday with our LSBU Sports Camp Olympics. The 5 to 12 years old Holiday Sports Camps are open Monday to Friday (excluding bank holidays) from 8.30am to 5.30pm. Take a look at an example of our Sports Camp timetable (PDF File 214 KB) (PDF File 204 KB) to give you an idea of the activities your child will take part in during our Sports Camp. £28 per child per day. £110 per child for the week (Monday to Friday, excluding Bank Holidays). A 10% sibling discount is also available. Terms and conditions apply. To enrol your child, complete the Registration Form (DOCX File 172 KB) and bring it along to the Academy of Sport reception where your application can be processed or email it to sportscentre@lsbu.ac.uk. Please read the terms and conditions on the form. As a registered childcare provider with OFSTED, LSBU Academy of Sport can accept childcare vouchers for all holiday Sports Camps we deliver. For more information on assistance available from the government towards childcare, please visit help with childcare costs on GOV.UK. For more information, please contact the Sport Development Team on 020 7815 7812.